This is my first post in my series of travel tips gleaned from Camp Jean. Until the iPhone App Store was launched, there was no way to put games onto the iPhone. You could play them online using a wi-fi or AT&T network connection, but if you were without a connection… no games. I knew that our destination, the Oregon Coast, was not going to be well served by any internet service. I have often bribed Dash with a game of Bejeweled on the iPhone, and I didn’t want to be without this vital element of my aunt coping skills. I loaded up a lot of free games from the App Store that looked like they might be fun for the kids. In the end, I did not download Bejeweled for the iPhone because it was priced at $9.99, and I think Dash was already starting to get tired of it. It took a little time to find good things to download: you can go to a page of the top iPhone free apps, but that will include lots of stuff besides games good for kids. This will sound really silly to a lot of people, but trust me: this is one of the most fun apps. It turns your iPhone into a Star Wars light saber. When the app is launched, you can wave the iPhone back and forth, up and down, and it emits the appropriate sound effects. Tip: You did read the disclaimer, right? Kids could easily get carried away and iPhones could go flying out of little hands. I use the Speck ToughSkin iPhone Case which gives more “grippage” to promote a firmer hold. Update: Oh no! George Lucas has forced them to pull PhoneSaber from the iTunes App Store. The rumor is that a licensed version might be available. So far iTunes hasn’t deleted this from my phone, but lots of kids and adults are going to be sad about this. A little like Guitar Hero for the iPhone. Music is played, colored bubbles must be tapped in time with the music. Violet and Jack loved this. Age group: 7 and up. Too fast and complex for the little ones. Tip: There is a co-op mode where two players can play against each other. Try to imagine two children tapping on your iPhone simultaneously. Re-read the disclaimer. Put the iPhone on a table so they don’t have to hold it, and to decrease the chances of the iPhone being dropped. This is a matching game. 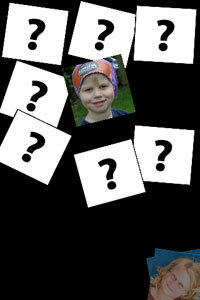 It can use your photos to create a game over 3 to 42 card-pairs, which means you can set it to be easy for the little ones or more difficult for the older ones. It’s very basic. Tap one card to turn it over, then tap a second card. If they match, the pair gets put in your pile. If they don’t, the cards are flipped over and you try again. Age group: 3 to 10. It can be customized to have as few as 3 pairs, and using your own photos makes it fun for older kids who have otherwise grown out of matching games. There is a timer and it counts how many tries you take, so there is a competitive element that appeals to the older ones (including Uncle Bob) as well. Tip: This is 1000% more fun for kids if you customize it with photos of them and things they know, like your house, pets, toys, etc. Click the little “i” icon in the lower right corner to access the customization options and then click on “Available Photos.” By default, there are a bunch of photos of European locations and lusty young women. (Typical…) You can delete these and add photos from your iPhoto library or your iPhone Camera roll. It’s a little tedious, but worth it. This provides a piece of digital bubble wrap that you tap on to pop the bubbles. It’s fun in a silly way that works for Jack-Jack (age 3), but it is also a game. After you’ve popped a number of bubbles, some of them randomly re-inflate and you have to pop them again. There is a timer and a score, which appeals to Violet (9) and Dash (8). Age group: 3 and up. Adults have fun with it too. Tip: As I might have mentioned, some of these games are potentially hazardous to your iPhone’s health. A good case and a steady surface on which to place your iPhone will help minimize your risk. 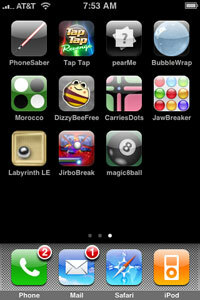 I’ve downloaded some others that look promising, like DizzyBeeFree and JirboBreak (which is not free, but only 99 cents). The kids have played with them briefly, and I’ll review them and more apps as we find them in future posts. Greg: You remind of a good point: the iPhone apps are also available for the iPod Touch. That’s a great product if you want almost everything the iPhone has in terms of photos, video and personal information management, but don’t want (or need) the phone part. My app, “BumperCars” launched in the App store about a week ago, and the feedback has been positive so far. It’s especially great for kids (or all ages, really), non-violent, has great music and is a simple and easy to use time waster. The link to the App store and my contact info is below. Check it out! Jason: Cool! I just bought it. My iPhone definitely needs new kid games. The niece/nephews have gotten bored with all the ones I have now. I’m all for playing games, but we like to play on the go, so when we started counting how many games we play in the car, some we created ourselves , it was dozens, so we created an iPhone app with 100 games families can play while traveling, called FAMILY CAR GAMES. A few games needed paper and pencil, some use the car radio…but mostly they’re “stuff”-free…guessing games, singing games, storytelling games, memory games. Pick a game…either with the spinner (like Urban Spoon) or by category or name…and then you can put the iphone away, no squabbles! My first game for the iPhone is finally out on the AppStore. It’s called Think Fast and it is a cute Math game for kids and adults alike. – English alphabets are displayed sequentially (like flash cards). – Alphabets are pronounced (Optional switch). Check out Morgan Moody’s Math Adventure. My son loves it. Some of these games sound like something my son would really like. I might grab one or two..but where is Little Cook? That is my kids favorite iPhone/iPod Touch game and it’s not on this site!! I have bought more than a couple of the games I have seen reviewed here but my little girl keeps going back to Little Cook. I would love to see it get a place on your site because unlike with SOME of the games she plays, she is really learning applicable knowledge from LC. Anyway, thanks for this wrap-up, I will be taking a look at some of these.